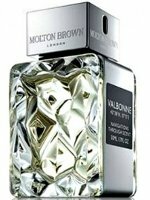 Molton Brown will launch Valbonne, a new unisex addition to their Navigations Through Scent series, in October. Valbonne was inspired by Grasse, and the origins of the perfume industry in the city's traditional scented leather gloves. Valbonne was developed by perfumer Jennifer Jambon; the notes for the floral fragrance include orange blossom, bergamot, mimosa, rose, iris, vetiver and leather. Molton Brown Valbonne will be available in 50 ml Eau de Toilette. Sounds not too bad… The name is strange though. I happen to spend my summer vacations in Valbonne – it’s a village near Grasse and there is absolutely no connection to perfume or the perfume industry. Probably they chose it because it sounds better than Grasse. Thanks, I did not know the origins of the name! It doesn’t look so much like Bang in person — it is glass with a metal casing on the sides only.